Captain Kirk in the now-classic Star Trek TV series was constantly badgering poor Scotty for “More power!” That’s what everybody wants. More power! One way to ensure the horsepower built into your engine is achieved is to seize every opportunity to seal that cylinder pressure on the push side of the pistons. A great way to take full advantage of the 21st Century engineering that goes into piston rings is optimize the break-in / ring seating procedure. This goes way beyond just choosing the right break-in oil, although that’s an excellent start. As we’ll see, the process is somewhat specific and less than rewarding if you screw it up! Bore finish will have a lasting effect on both how well the rings break in and the extent that they seal both cylinder pressure and keep oil out of the chamber. Idealizing ring seal starts with proper cylinder honing. It’s beyond the focus of this story to get into specific procedures, but a proper torque plate honing with a 45 degree included honing angle is certainly moving in the right direction. That included angle helps both retain oil and also promotes ring movement within the grooves, which is important to maintain sealing. The somewhat rough surface of a freshly-honed cylinder is established in part to promote a wear pattern between it and the ring face. In order to do this, the rings will remove the microscopic peaks created by the honing process. Creating the proper height of these peaks and the depth of the valleys will significantly improve the potential for ring seal. Lubrication is another critical element in this process but oil can only achieve its intended goals of lubrication and improving ring seal when the other conditions are also met. When assembling the engine, JE recommends using either engine oil or a light machine oil for the cylinder wall and rings. This lubricant will be present only for the initial revolutions until the engine starts. Highly viscous or sticky engine assembly lubes should be avoided around the ring package. 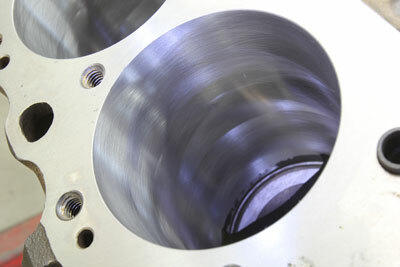 Cylinder wall taper or out-of-round makes the ring’s task of sealing and break-in much more difficult. This places a premium on proper honing technique and finish. This brings us to how the engine should be run after initial startup. The ideal combination is to tune the engine so that it starts on the first or second revolution. For carbureted engines, this means pre-filling the fuel bowls and accurately setting the initial timing. As soon as the engine starts, immediately bring it up to an above-idle speed. According to JE’s Senior Technical Account Manager Alan Stevenson, “You don’t want to break-in an engine at idle. 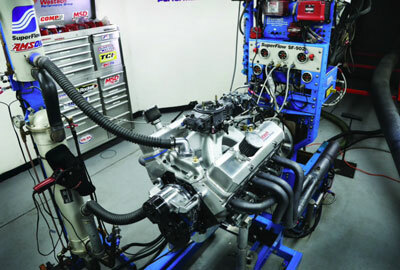 You want to keep the rpm above 1,500 and vary the speed continuously for about the first 20 minutes.” After bringing the engine up to normalized coolant and oil temperature, put the engine under load. The cylinder pressure from 50 to 75 percent and eventually to 100 percent load will place additional pressure on the back side of the rings which will quickly establish the proper wear pattern for seating. With today’s rings, especially moly-faced versions, this can be achieved in a very short period of time and certainly within 20 to 30 miles of street driving. In WOT dyno testing, likely the rings are seated by the end of the first few runs. Note how the second ring is worn only on the bottom half – which is where this oil control ring should wear. The top ring wear is difficult to see but is actually only contacting in the center of the moly inlay finish. 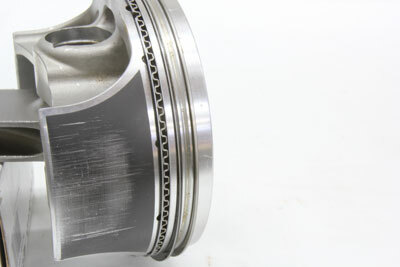 Engine enthusiasts are often quick to condemn a ring as “not seated” because the wear pattern is not spread across the full face of the ring. This is unfortunately an incorrect assumption. Nearly all top rings offer a barrel face where only a portion of the ring at the widest point is actually in contact with the cylinder wall. So only a small part of the ring will exhibit wear. A top or second ring that exhibits full face contact should be considered worn out. Proper ring performance and sealing is based on the rings sliding across a coating of oil between the ring and the cylinder wall in much the same fashion as a crankshaft journal rides on a thin film of oil between it and the bearing. Glazing is a term often used when discussing a cylinder that is not broken in properly. This often occurs after an engine has been run at idle or very light load for a sufficient enough time. This creates a case where oxidized oil has collected on the cylinder walls and created a somewhat shiny surface coating that has completely filled in the peaks and valleys of the honing process. As a visual reference, imagine the microscopic cross-section of a freshly honed cylinder wall as similar in appearance to the side view of a hack saw blade with multiple peaks and valleys. Now imagine looking at a used hack saw blade where the teeth have worn nearly smooth. That’s what a glazed cylinder wall would present to the rings. 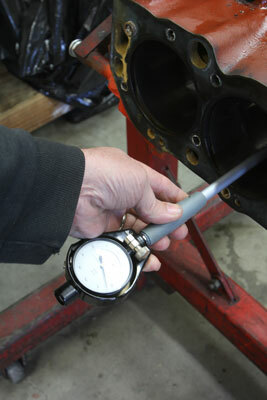 Establishing ring seal begins with proper assembly and that means cleaning the cylinder walls. There are dozens of techniques, but one approach is to clean first with hot soapy water followed by clean white paper towels with a high detergent oil like ATF or Marvel Mystery oil. This towel still shows grit after four earlier cleaning passes. Keep going until each bore is clean. With the peaks and valleys filled in, the glaze creates an extremely smooth surface, making oil control very difficult. The net result is excessive oil usage. Sometimes this glaze will exhibit excessive oil consumption with or without the presence of the classic blue oil smoke. A quick way to evaluate above-normal oil usage is to pull the spark plugs and look for oil on the threads of the spark plugs. This is a common warning sign of a loss of oil control. If you suspect the rings have not seated, sometimes this can be addressed with a top-end cleaner. This does not mean dumping a couple of teaspoons of Bon-Ami cleanser down the intake. While laughable, that flathead era recommendation has somehow survived the electronic age. But reputable top end cleaners have been used with some success. Glazing can also be traced to an over-exuberant choice in break-in oil. There are probably almost as many choices for boutique engine oil as the Kardashian girls have in shoes. According to Stevenson, selecting a break-in oil should focus first on ensuring the oil is compatible with the camshaft. A flat-tappet cam will require a greater concentration of high pressure lubricants like zinc dialkyld-dithiophosphate (ZDDP) compared to pistons rings so selecting a break-in oil should prioritize in that fashion. There are no industry ZDDP level standards for break-in oils. For a high performance, non-API break-in oil, a common concentration would in the neighborhood of 1,000 to 1,500 parts-per-million (ppm). 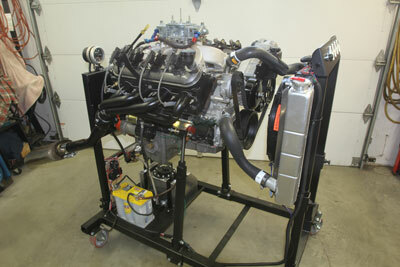 Engine test stands are great for checking for runs, drips, and errors but should not be used to break-in rings. Proper ring break-in requires a load be placed on the engine as soon as possible. Problems can occur when the “more is better” theory is applied and ZDDP concentrations radically exceed the above-mentioned levels. An excessive ZDDP level accompanied by low levels of detergents is a poor combination. ZDDP tends to molecularly bond with metal while detergents work to strip these same additives from areas like the cylinder wall. If excessive ZDDP levels are used, this can cause cylinder wall glazing and loss of oil control. Of course, the rest of the engine configuration must be properly prepared as well. 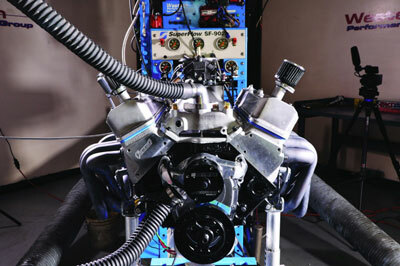 A common cause of ring seal failure is created if the engine is run with an overly-rich air-fuel ratio. Carburetors are often accused of this malady, but a poorly-tuned EFI system running at 10:1 air-fuel ratio can do an equal amount of damage. Excessively rich air-fuel ratios allow raw fuel to strip oil off the cylinder wall, minimizing the lubrication at the precise time that the rings and cylinder walls need it the most. Part of a rich mixture mistake is the widely-maintained misconception that lean idle air-fuel ratios cause an engine to run hotter. The reality is that lean idle mixtures minimize temperature gain as less heat is exposed to the cooling system because less fuel is combusted. 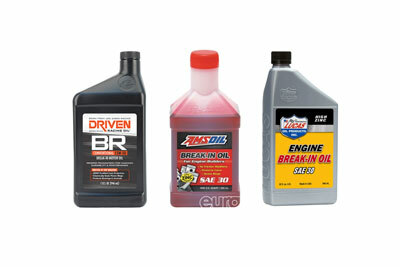 Choosing the correct break-in oil is pivotal for proper engine break-in. Almost every quality oil company offers a break-in oil that dispenses with some of the additives that can inhibit the break-in process. If an engine is allowed to idle in an overly-rich condition for as little as 30 minutes, this can cause sufficient cylinder wall damage where the wall may exhibit a dull, dark grey color. If this occurs, the engine will likely require complete disassembly and fresh honing. Break-in oil should also only be used for initial engine run-in and then changed along with the filter and replaced with the engine oil you intend to run. On a street engine, this would mean less than 100 miles. 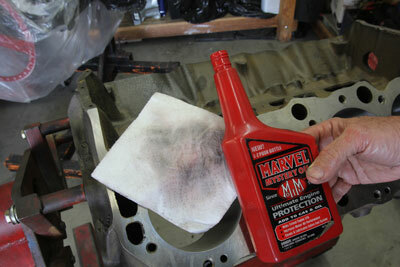 Changing the break-in oil removes the impurities that will be present in the oil from the break-in period. This is especially true with race engines that use less restrictive filters. JE also recommends avoiding synthetics during break-in in order to take full advantage of establishing wear patterns. Synthetics sometimes can do too good a job of reducing friction so that the rings cannot seat properly. When breaking in an engine, it is important to vary the load on the engine. A dynamometer often has a preset break-in mode that varies load and engine RPM. What should also be avoided is custom blending your own additive package either for break-in or long-term operation. Lubrication engineering is a complex game of blending a base oil and additive package brew that is intended for a specific application. So choosing the right lubricant is a great way to ensure your new engine starts life in the best way possible. 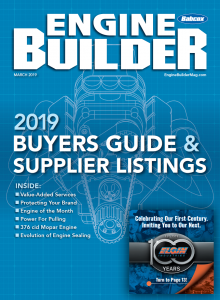 Piston ring break-in and optimized sealing isn’t difficult if you pay attention to the important initial steps on the way toward proper care and feeding of a high-performance engine.